A remnant of the '70s, The Enforcer is a mean muthafucka, a hard-boiled private eye, armed with only his smokes, an endless supply of sandwiches, his piece, and his street savvy. What's it all about? As long as he keeps on truckin', and beating the crap outta the bad guys, WHO CARES??? 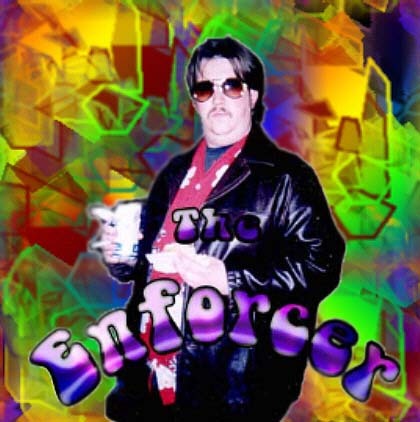 Catch The Enforcer, Tuesday nights at 9pm, on the NEW W.O.R.T. The Enforcer, Chef Ryan, Rock Lancelot, Mr. Laffypants, Rusty, and ALL other original characters, and concepts, copyright and TM 2006.